Stik-A-Flag Skier Down Flag - Eliminates observer s elbow! 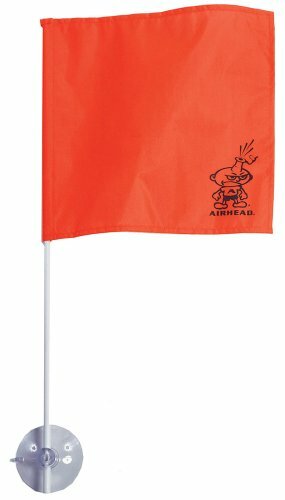 The bright orange 420-denier nylon skier down flag is mounted to a 24 pole. Attaches to windshields or boat and personal watercraft finishes with Kwik Tek s giant 3-1/4 suction cup. Required in AZ, CA, CO, ID, MO, NE, NM, OR, TX, UT & WA. Recommended everywhere for safety. Patented. 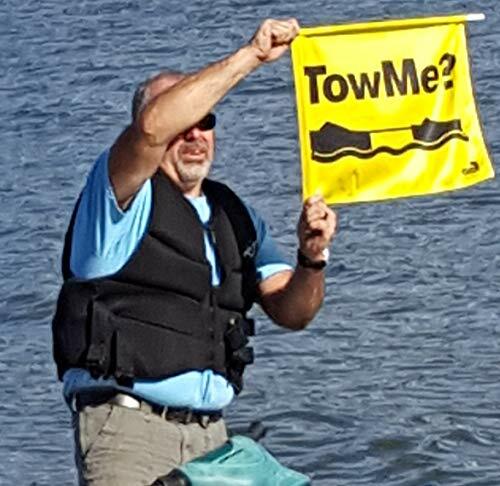 Meet legal requirements while boating with the Shorleine Marine S.O.S. distress flag. 3' X 3' Flag meets all requirements for USCG daytime signaling device. Great piece of safety gear to keep tucked away on your vessel. Meets United States Coast Guard Secifiations For Daytime Distress Signalling. Flag Buddy Skier Down Flag Holder. Flag Included. Orange Safety Flag Included. Tired of Holding The Skier Down Flag? Just clamp The Flag Buddy to Your Window and Rotate it up When Required. Made in the USA, Won't fall off like the suction cups. This is an American/USA flag with pole socket. 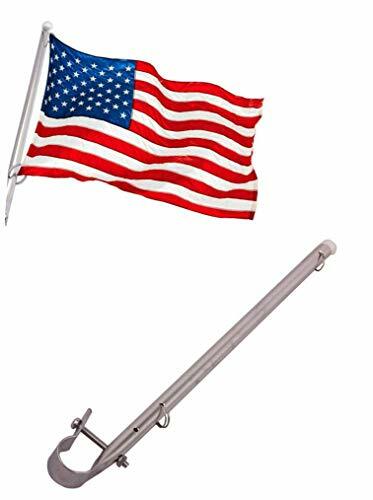 The flag pole is durable because it is made of quality stainless steel. It is easily be able to mount on the top of pontoon. This is the dimension of the flag: 19 3/4" (width) x 11 3/4" (length) pole length: 24" item number: Pb010100. This is an American/USA Flag with pole socket. 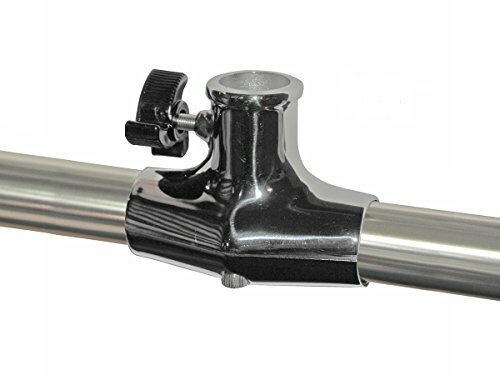 The flag pole is durable because it is made of quality stainless steel. It is easily be able to mount on the top of pontoon. Flag's Country of Origin: China, Flag's Fabric Type: Nylon. Embroidered stars and sewn stripes. 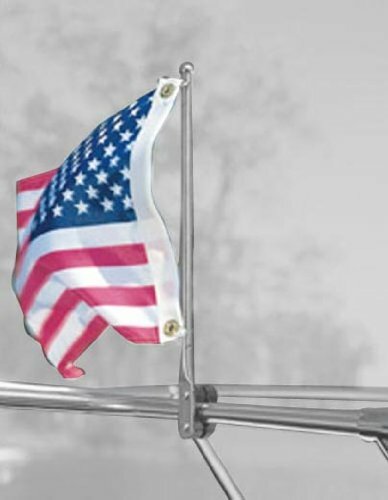 The original Charlevoix Flag Clip ends the trouble of attaching your flag to a standard flag or stern light pole. 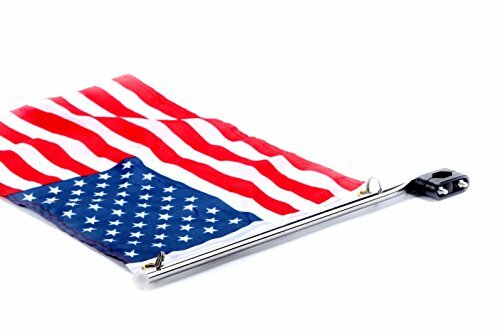 This simple one-piece clip attaches semi-permanently to your pole and will keep your flag securely in place at speeds up to 50 miles per hour. Flags can be attached or removed in seconds. The clips can als be removed, if desired. Sold in pairs. MEETS STATE REGULATIONS - 20 by 24 with a stiffening pole to comply with state laws. Most states (including Florida) require these specifications. 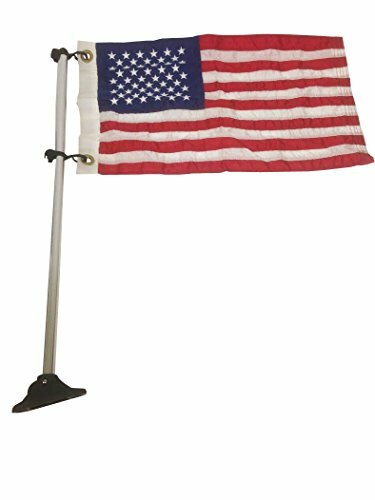 COLLAPSIBLE STIFFENING POLE INCLUDED - Keeps flag fully displayed in still conditions. Pole fits through sleeve and into velcro pouch to keep it secure. Folds into 3 sections like a tent pole for easy storage. EASY TO USE MULTIPURPOSE DIVE FLAG - Quick and simple assembly. Use on a boat, off the beach, or attached to a float. Includes 2 Zip Ties. 100% MONEY BACK GUARANTEE - All flags are backed by 100% guarantee. If you're not satisfied we will replace it or refund you. 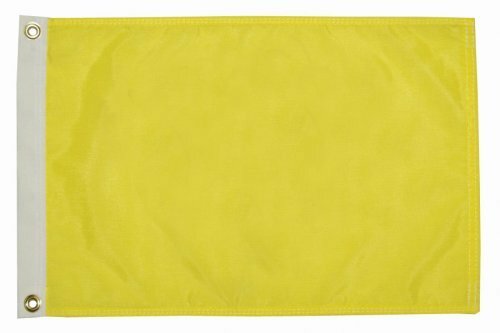 This 12" x 18" Yellow Quarantine Flag is also known as a courtesy flag. Its use is for boaters to signal their entry status into foreign countries via sea. The flag signifies you have entered foreign waters but have not yet cleared customs in the country they are entering. 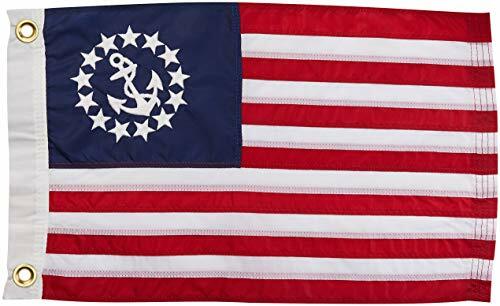 Flag etiquette for small boats entering the Bahamas is as follows: If US registered, fly the US Ensign on your starboard outrigger or radio antenna. When within sight of land in the Bahamas, run up the yellow quarantine flag on the port outrigger, signifying know you are in Bahamian water and have not yet cleared. After clearing into the islands, replace the yellow flag with the Bahamian courtesy flag, which now signals your home country and that you've cleared into the current one. When returning to the US, temporarily replace the US flag with the yellow one, until you've cleared Customs there. MADE OF DURABLE NYLON. BRASS GROMMETS - for durability. Bright yellow color for clear visibility. MEETS REGULATIONS - 12 by 18 to comply with international protocols. PREMIUM QUALITY- Waterproof, easy to fold and store, bright colors and double stiched. EASY TO USE MULTIUSE FLAG - Quick and simple to use. Fly this flag when you enter forigen waters before you have cleared customs and again when you are reentering your home country on the return trip. 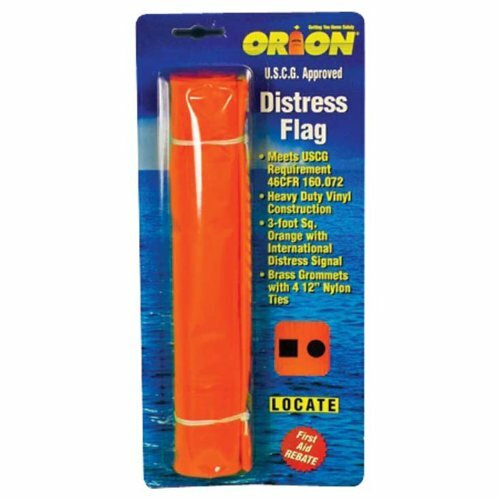 United Sates Coast Guard approved distress flag bright orange with international distress sign printed in black on heavy-duty vinyl that measures 3 x 3-Feet. Meets NY and OH requirements. U.S.C.G. regulation size: 20" x 24"
Designed to securely fasten to either 7/8"- 1" or 1-1/8" - 1-1/4" rails, these stainless steel mounts will look great and provide years of service. Both models are perpendicular to the rail and are made for 1" diameter flag poles. 1" Mylar International Code Flag Letter Decals, Stickers available in the complete alphabet. Waterproof and weather resistant finish ideal for exterior use. 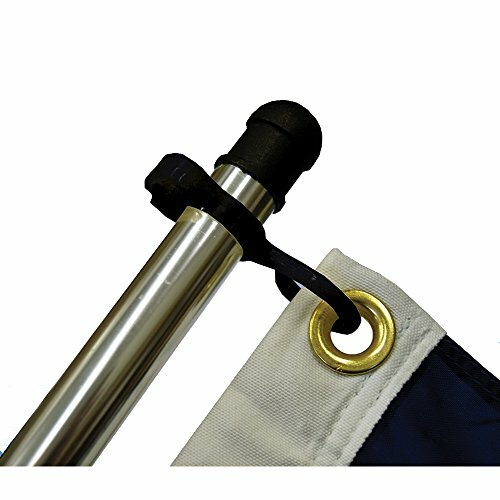 Water Sports Flag Holder for Bimini Tops & Pylon Extensions - It has been difficult for boaters with Bimini tops to display water sports flags effectively, until now! 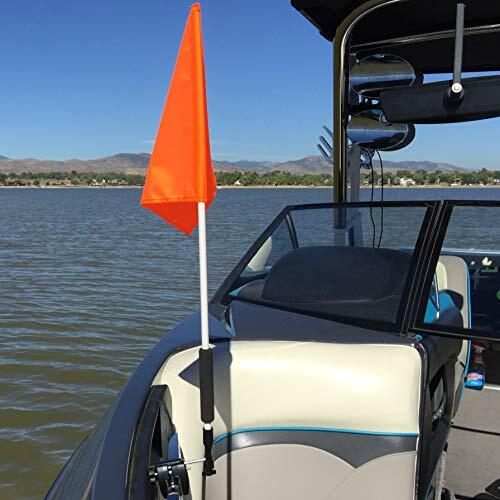 Instead of manually holding the flag below the canvas top, your flag will fly above the top, enabling other boaters to see it. It also frees your hands to tend to other activities. ARHEAD Bimini Top flag holder is crafted from polished anodized aluminum. 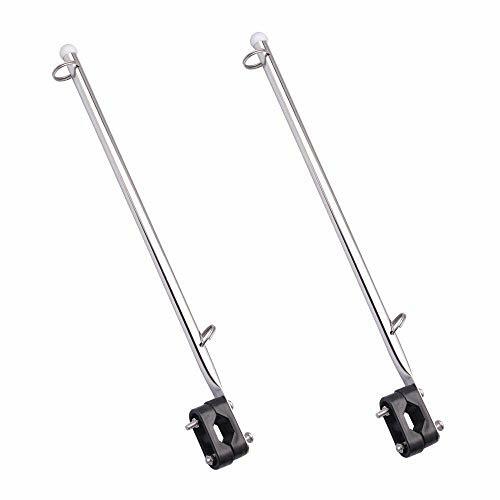 Attach it in seconds to one of your boat Bimini top support poles with the 2 zip ties included. The soft polymer caps are designed to eliminate rattling. Designed to be used with AIRHEAD 4 foot water sports flags. Also great for pylon extensions! 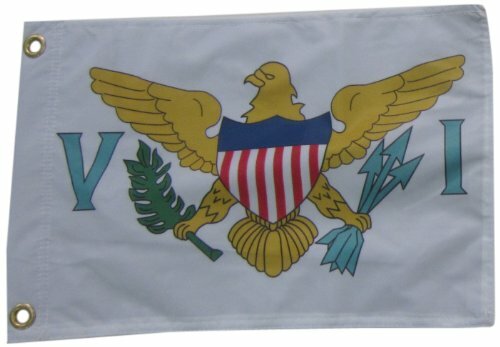 US Virgin Islands flag. Proudly display your countries nationality with its flag, these flags are reinforced 2-ply print dyes nylon with brass grommets for corrosion resistance, superior sun and water fade resistant. Country flags are 12" x 18". 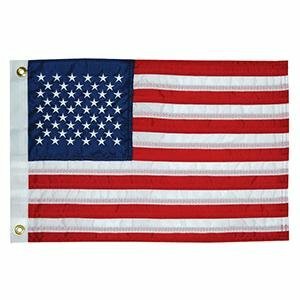 High quality US made Scuba Diving Flag. Double stitched through out with high visability Red and White 100 denier nylon. Buy American, stay American. DIVE FLAGS - Universally recognized nylon scuba diver flags to satisfy local diving safety requirements. DURABILITY TO LAST - Our rugged diver down flag is made with 100% top quality 100 denier nylon to ensure long-lasting, everyday use. Nylon is highly resistant to degradation from UV rays, moisture, abrasions, chemicals, and oils. Foldable Pocket Flag - Does not include flag stiffener. Allows for flag storage in your pocket. 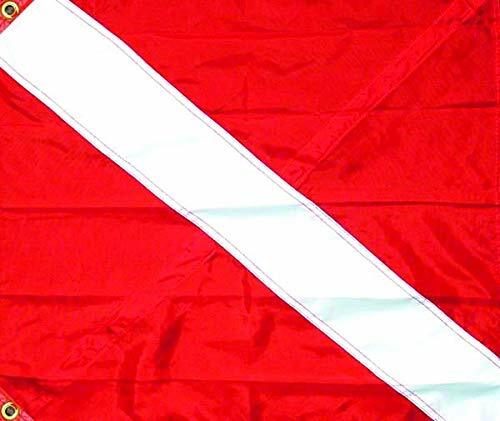 SIZES & COLORS - Performance Divers - Diving Safety Flag is available in two versions: US version (Red & White) and International version (Blue and White). 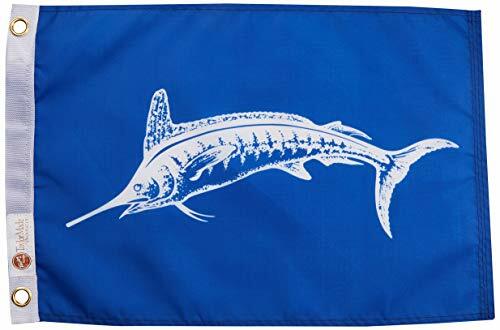 Dive Marker Flags come in six different sizes: 14 inches x 18 inches, 20 inches x 24 inches, 31 inches x 36 inches, 42 inches x 52 inches, 48 inches x 60 inches and 6 foot x 8 foot, with the option of a built-in flag stiffener. Made in USA with quality you can see. This 15'' long stainless steel flagstaff comes with a nylon rail clamp and split rings. Fits 7/8''-1'' rails. 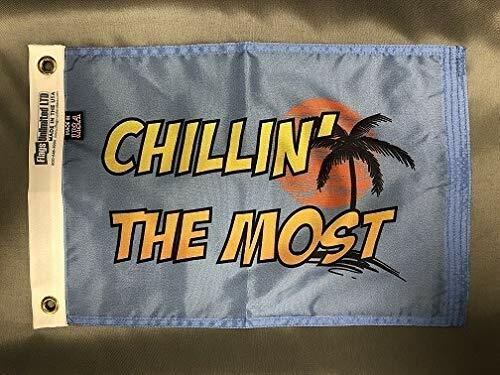 Chillin' the Most 12x18 inch boat flag. Made of 200 denier nylon, double stitching all around with quadruple stitching on the fly-end for durability. Canvas header and brass grommets for durability on the water. Large 15" x 20" flag. Comes with a 24 attached floating pole. 1.100% Brand new and high quality. 2.Reliable and durable:made of polished stainless steel. 5.Please check the size before you confirm the order and we are always here for you. Reliable and durable:made of polished stainless steel.